The Drop Shot Rig is so unique because it allows you to suspend a soft plastic lure (or others) off the bottom at a controlled height which can range anywhere from a couple of inches to 5 feet. Why is this important? Well for starters, think about the prey that bass feed on. Most baitfish don’t just lay dead on the bottom, they suspend…unless they are truly dead. Depending on conditions they can be found close to the bottom suspended just above cover like weeds, rocks, brush piles, etc. At other times bass might be suspending out in deep open water areas waiting to ambush schools of baitfish. TIP: Use a Palomar knot to tie on your hook and leave 2’-3’ of line on the tag end. Then you can adjust the weight until the hook is at the perfect height that results in the most bites. TIP: When drop shotting, if you spot a bass suspended higher in the water column on your electronics, you can quickly raise the rig up to the strike zone, slowly lift and drop your rod tip until you see the bass following its movement on your graph and stop and hold it still. It’s a great way to entice a bass into striking from the water column. Ready for some more advanced tips and tactics on Drop Shotting? Read The Complete Guide to Drop Shotting. There’s just something irresistible about a lure skipping across the water that triggers aggressive strikes from bass. In many cases, bass will even hit a lure while it is still skipping along the surface. If you’ve ever seen a baitfish fleeing while under attack, it’s easy to understand why the skipping action gets the attention of bass in the area. When you skip a lure, it mimics the action of something trying to escape from a predator. Bass are competitive by nature, so if you can stimulate a reaction strike with a skip cast, you can increase your cast to catch ratio dramatically. Skipping and Pitch-Skipping are also techniques that I use to put a lure into places that cannot be reached with your typical cast. When you have the room to make a sidearm skip cast, you can get your lure way back under docks, boat houses, hanging trees, culvert pipes and other objects that are blocking access to high percentage areas. Over the years I have developed a technique that I call “Pitch-Skipping”. It combines a pitch cast and a skip cast and gives me the ability to shoot a lure without needing to make a sidearm cast. It’s deadly from a boat and even more so when you’re fishing the shoreline where trees and brush can make for some tight casting. To learn my skip-casting technique along with a step by step guide packed with great tips for skipping, pitching and flipping, check out our video “How to skip with a baitcasting reel”. Sometimes you need a silent approach in order to get a strike. If you notice that you are spooking bass when you are skipping a lure, it’s time to change your approach. This is where Flipping and Pitching really outshines other presentations. In the video above we also demonstrate the difference between a flip and a pitch cast. Flipping involves the use of one hand to hold the rod and the other to draw back slack line and then guide your lure into the water by controlling the speed of entry. This technique works best when you are making a lot of repeated presentations into cover and weeds that are close to you. 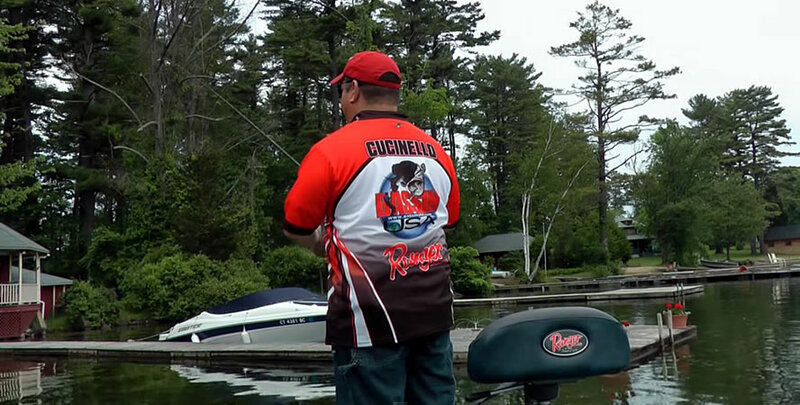 TIP: When flipping, twist your wrist slightly so that your reel handle is not in the way of your line. Pitching gives you the ability to make a similar quiet presentation to targets that are further than you can reach with a flip cast. In both cases, your lure enters the water very quietly and will catch unsuspecting bass off guard. These techniques can get a reaction strikeout of the spookiest of bass under some of the toughest conditions. Both of these techniques are an absolute must know for every bass angler. a) Choose a deep diving crankbait that can get down around 20’ deep. From magnum to finesse, swimbaits flat out catch bass and big ones! When most people think about swimbaits, they think of the guys out west chucking monster swimbaits for giant California largemouth bass. Swimbaits can catch bass just about anywhere. If you’re not in the know, you are missing out on a real game changer. Largemouth bass, smallmouth and even spotted bass chase open water baitfish. Depending on where you live and what the predominant species of baitfish determines the type of swimbait fishing you should be focusing on. In California, monster Florida strain largemouth bass grew to enormous sizes feeding on large rainbow trout which are annually stocked in many of the lakes and reservoirs on the west coast. If you’re from an area that fits this criteria, and want to seek out a trophy of a lifetime, then you might want to look into lures like the Huddleston Deluxe or some of the other larger swimbaits on the market. If you’re looking for numbers, versatility, and size you may want to try a different approach. To learn this technique and to check out the Keitech swimbaits in action, watch our video “Big Winter Smallmouth”. d) Extra Wide Gap (EWG) or Octopus style hook. 2/0 – 5/0 depending on the size of the Senko or worm. It can be challenging to know what bass fish want. Sometimes it’s the little details that can make all the difference. Pay attention to how the bass are reacting to your lure movements… sometimes they don’t even want it to move.